The celebration of Christmas is unabashedly Catholic. 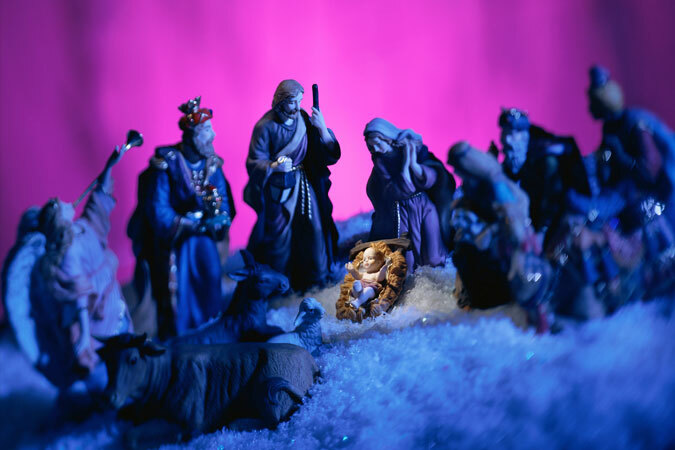 These five characteristics are integral to the Christmas story, and Christmas can help us to strengthen our Catholic identity. I offer you these thoughts as my Christmas reflection. A Sense of Sacramentality—Sacraments are signs, tangible realities that point to the intangible mystery of God’s grace. Christmas celebrates Jesus as the “sacrament of God”—the Word become flesh. In Jesus, the divine becomes tangible. In the Eucharist, we continue to encounter the Word made flesh in a very real way. We Catholics are a sacramental people who encounter the transcendent God through the immanence of sacraments and sacramentals. As St. Ignatius of Loyola taught, we find God in all things! A Commitment to Community—Why is it that at Christmas, we go to such great lengths to bring family together (even when it proves to be painful)? It is because we are inherently communal. Catholicism, at its core, is Trinitarian, meaning that we believe in the communal nature of God: Father, Son, and Holy Spirit—one God, three Persons. In light of this, Catholicism is not a “me and God” experience, but an experience of finding God in all people. Christmas celebrates how God became one of us through his Son Jesus, through the power of the Holy Spirit. Christmas reminds us of our duty to reconcile broken relationships so that we can be truly communal, thus reflecting the image of God. Respect for the Dignity of Human Life and Commitment to Justice—Catholicism is Incarnational, meaning that God became human in Jesus. In doing so, God brought divine dignity to the human condition. As such, we believe that every human being deserves that which respects his/her dignity. Our belief in the life and dignity of the human person (from the moment of conception until death) is the foundation of our moral vision. Christmas is a time when we renew our commitment to care for the poor, beginning by recognizing their human dignity. This is a year-round commitment, not a token holiday gesture. A Reverence for Tradition—Few celebrations are as steeped in tradition as Christmas. We have religious, cultural, and family traditions. Catholics believe that God reveals himself to us in Scripture and in Tradition. We look to the past to see how the saints before us encountered God’s grace, so that we can recognize that grace in the present and move confidently into the future. Like Ebeneezer Scrooge who vowed, “I will honor Christmas in my heart and try to keep it all the year. I will live in the past, the present, and the future. The spirits of all three shall strive within me,” we too allow the traditions of the past to speak to the present and to point us confidently to the future. A Disposition to Faith and Hope, Not Despair—As we mark the darkest day of the calendar year, our Advent wreaths are shining brightly with all four candles lit—a sign that the light of Christ dispels the darkness of our lives. We Catholics are a people of hope. We belt out the song “Joy to the World” during the Christmas season. However, all year long, we “wait in joyful hope for the coming of our Savior, Jesus Christ!” This joy is fueled by the realization that God loves us so much that he gave us his only Son, which is what we celebrate at Christmas. This worldview calls us to be evangelizers, eagerly proclaiming the good news of Jesus to others in word and deed. The joy of Christmas is a joy that we are called to carry with us year-round!